The sink in the master bathroom started to leak. The plumber was supposed to come in the afternoon but couldn’t come until after dinnertime. While the plumber tooled around under the sink, James and I were standing on top of our bed trying to fix the ceiling fan and light. My arms ached as I held up the light while James worked with the wiring. Let’s just say it didn’t work the first time (or the second, or the third). I had a choice. Would I complain about my aching arms and quarrel with my husband in the heat of the moment? Marriage is a lot like having a massive home improvement project for life. There’s always something new to work on. Now in the beginning, you marry Prince Charming and there’s not a blemish on him. He looks perfect. And there’s not a blemish on you either. But as you begin to do life together day after day, you soon realize you need to put some elbow grease into the relationship to keep the magic alive. 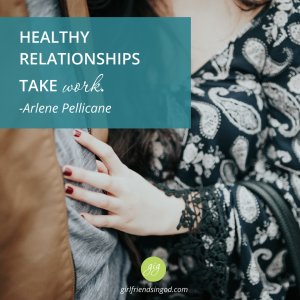 Healthy relationships take work. You don’t have to be married to mine the wisdom of today’s verse. In Solomon’s day, roofs were flat and small rooms could be built there. Today’s verse is repeated verbatim in Proverbs 25:24, “Better to live on a corner of the roof than share a house with a quarrelsome wife.” In other words, it’s better to live sparsely in peace than live in comfort with quarreling. It would be better to live in a dusty, little room than in the prettiest most Pinterest perfect home if it meant a complaining, argumentative woman would be living there too. Quarrel can be defined as “an angry argument or disagreement, typically between people who are usually on good terms.” Whether married or single, I don’t think any of us want to be known as a quarrelsome woman. So the next time you feel like fighting with your spouse or someone else, extend grace. Instead of being contentious and argumentative, be gracious. The more gracious you are to others; the more others will be attracted to you. Your loved ones won’t try to escape to the roof. They’ll be happy wherever you are. That sounds a lot like a dream home to me. Dear Lord, I don’t want to be known as an argumentative, quarrelsome woman. Forgive me for grumbling and complaining. Help me to get along with the people in my life. Fill me with Your Holy Spirit. May I show love and grace to others today. What’s one way you can create more peace in your relationship with your spouse, child, parent, or friend? Need a little help to turn your fixer upper into a dream home? Learn how to improve your marriage in just 31 days in Arlene’s book 31 Days to a Happy Husband. Quarreling is terrible, so my advice is to watch out who you let stay with you or move in, even temporarily. I have had experience in this, and it can turn your peace into noise in a moment. I feel like I am the quarrelsom wife. I have prayed about this yet I go right back. Sometimes I feel like everyone would be better off if I left. However, that’s what satan wants, not God.